"Mike is the best agent around. He was extremely helpful in fulfilling all my needs at a price that was easy on my wallet." "The Son's Group has been my insurance agency for the last several years. They are very personable and always respond promptly whenever I need them." Mike Jr. handles my business. However, if he’s not available his father doesn’t hesitate to step in and help. I have never had to wait for a return call. They always have their client's best interest in mind. They do their very best to match their client's needs to the products they have. I have never been disappointed in their service. I would highly recommend them. The Son's Group is a full service insurance agency in Crete, Illinois and St. John, Indiana and will accurately asses your financial situation in order to help you find a life insurance policy that fits your needs and your budget. Since 1987 we have been dedicated to providing individuals and businesses with high quality insurance and investment products. We are committed to helping our clients protect what's most important to them. You probably know it’s not acceptable to pay your babysitter in bubblegum. What you may not know, is what the fair market rate of pay is for a sitter these days. We break it down for you here. Using child safety locks is absolutely necessary if you don't want your toddler to open every cabinet in the house. Think safety first and check out these great options. How you install your child’s safety seat, as well as choosing the right type of safety seat, are what matters when it comes to keeping your kids safe in the car. Find out why not doing these two things correctly could have devastating consequences. If you're in your 30's and you're trying to figure out what kind of life insurance you need, you'll want to read this. This is what you need to know when you're searching for the best life insurance for 30-something's. Cutting corners to save time in the kitchen can pose a real danger to you and your family, especially if you’re using hot tap water to prime your pasta pot, prepare a cup of hot tea or mix up baby formula. Find out why! Preparing for the Worst: How Much Life Insurance Do I Need? Have you been asking yourself the questions, "How much life insurance do I need?" If so, make sure you take a look at this guide to find answers. Did you know life insurance can be used to help pay for college? Here’s what you need to know about how life insurance can help you save for your child’s college fund. When it comes to life insurance, parents often wonder if they need to purchase additional coverage after their baby is born. Here's the answer. Did you know life insurance and estate planning go hand in hand? There are some facts that are important to know. Learn about how they could benefit you. Attention Business Owners: There is a life insurance policy you can purchase for your business called Key Man Insurance. Find out what it is, how it works and why you shouldn’t go another day without it. Can Smoking Pot Have an Effect on Your Life Insurance Rates? It’s no secret that legal use of Marijuana is a hot topic in the U.S. right now. 31 states have legalized pot for medicinal use, with 9 that have also legalized it for recreational purposes. Did you know that smoking pot might affect your life insurance premiums? To find out more, read this article! Did you know that there are types of life insurance policies that can benefit you while you’re still living? Policies with “living benefits” allow a policy holder to access some of the policy’s proceeds while he or she is still alive. To learn more about how accelerated death benefit policies might benefit you, read this! College has gotten so expensive now that you've got to start saving for your child's education as soon as he or she is born. If you need some pointers on how to get started, check out this article. While most life insurance policies require a medical exam, there are several life insurance policies that require no medical exam. This is one type of policy that isn't right for everyone, but could be for you. Continue reading to learn more. In the 1960's, 72 percent of Americans had life insurance. That number dropped to 44 percent in the year 2000. This drop may have happened because many people don't think they can afford life insurance or don't know their options. Do you wonder what whole life insurance can do for you? Then this guide is for you. Keep reading for everything you need to know. Children are fragile; they demand your extra care and attention. One of the best ways to protect your family is to purchase child life insurance.If you're considering life insurance for your child, we've created the ultimate list of five essential things to know. 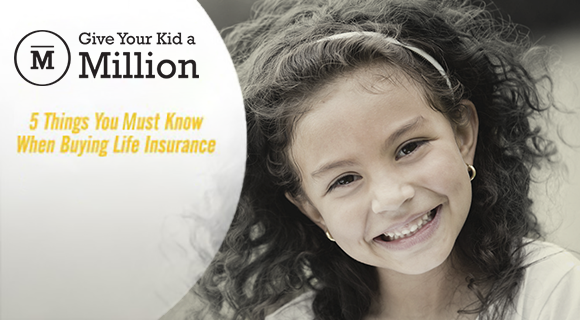 Read this to learn more about buying life insurance for your children. Single Dads: Are You Putting Your Kids at Risk? Did you know that single dads with household incomes between $50k-$250k are most at risk for dying without ANY life insurance at all? Find out more here and protect your family! There may be lots of things you know about life insurance, but these three facts may surprise you. This short video explains how getting life insurance is probably easier than you think, where you can find the answers to your life insurance questions and the easiest way to get a quote. Did you know that Term Life Insurance is more affordable than you probably think? Watch this quick video and learn all about it! 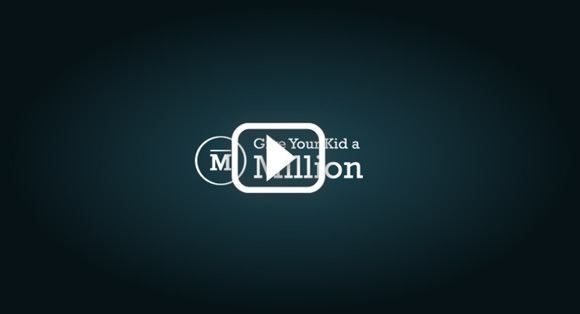 Get a free quote from your independent Give Your Kid A Million agency partner today! New from Give Your Kid a Million - a complete guide for new and expecting parents. Find out what life insurance is, why it's important and what type of policy might be best for your family! The birth of a child is an exciting time in your life. There are so many new memories and happy times ahead. But along with that also comes some additional financial responsibility which should include having a plan for the unexpected. Can You Be Approved for Life Insurance When You Are Pregnant? Life insurance is typically purchased in order to ensure that loved ones and survivors won't have to face financial hardship in case of the unexpected. When an applicant has certain health issues, though, qualifying for the needed coverage may not necessarily always be easy. This could be the case when a woman is pregnant. Crete, IL Crete is a village in Will County, Illinois, United States. The population was 7,346 at the 2000 census. St. John, IN St. John is a town in Lake County, Indiana, United States. The town of St. John has homes in St. John Township, Hanover Township, and Center Township. St. John was founded in 1837.